SM Morgan, Lab for Evolution & Development. The student write-up room (post grad/student office) for our lab is decorated with lovely pieces of random detritus collected from various conferences and meetings across the world. I don’t usually notice it — but we do have quite a range of…well, crap. This week, an innocent wee lass asked us why we had all of these ’weird toys’. And ‘weird toys’ is possibly the best reference to all of it. Conferences are like Comic-Con for scientists — massive gatherings of like-minded people, talking about their work, their passion — and being ensnared by advertising for scientific products. You might not even think of it — but there is fierce competition in the test-tube market. 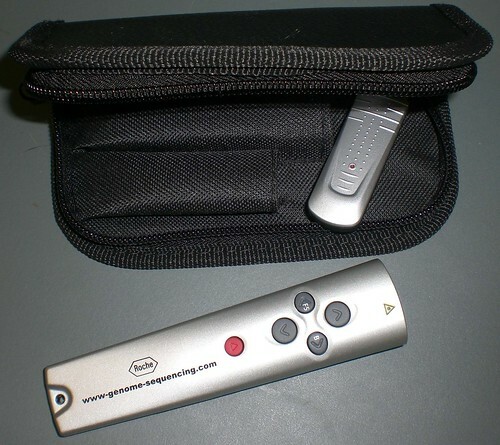 Like all good geek-gatherings, give-aways are a must. 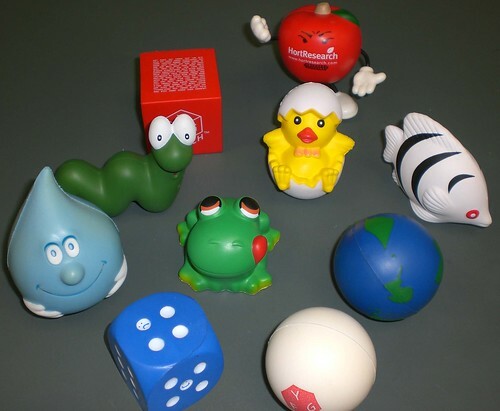 There’s the classic stress ball gimmick — because everyone knows science students and academics are all stressed out of their brains — that, or it’s common knowledge that we all need something to throw at one another during downtime (aka incubation steps). And of course, the non-science related kitchen equipment; Mugs, cups and tools. ‘cause, like — scientists drink bucket loads of ‘coffee’ right?! 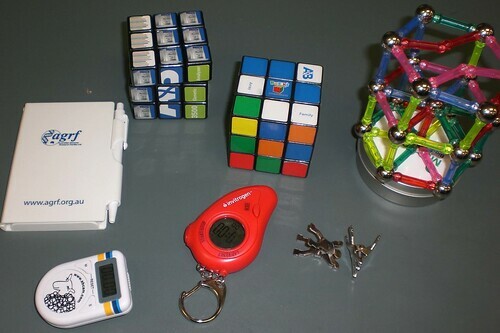 And then there are the real toys; the branded Rubik’s cubes, magnetic balls, clippy stackers etc etc. Finally, the most abundant of all: pens. 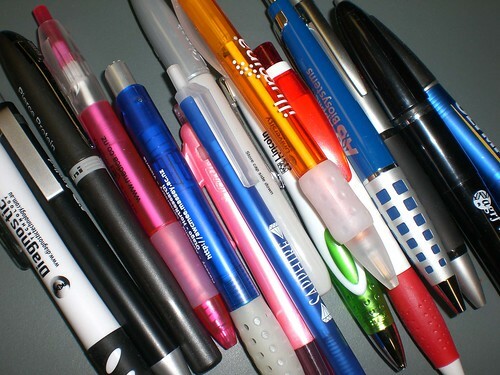 Pens of all colours, sizes, ink types, add-ons and quality. Pens with 2 ends, pens pretending to be ink – but turn out to be erasable, pens with sticky notes hiding inside, silver pens and pens in the shape of pipettes. Clothing is another issue all together. I know many a scientist (both student and academic) who is smugly proud of their free science t-shirt collection. 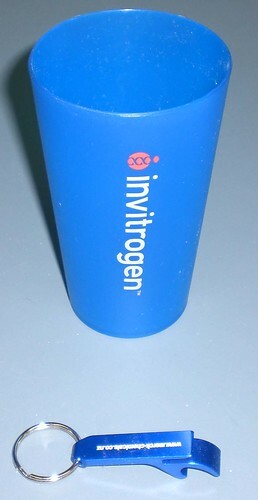 What is it about gimmicky free stuff at conferences that make scientists go wild? I think it is the young-at-heart factor — the creativity, the (not so)hidden child in all of us. Something that none of us lose (hopefully) since such a skill is required to dream up new experiments and ways to tackle problems daily. Show us free stuff, cool toys and neat crap and we all go a bit nuts — pens are ultimately useful, I’ll grant you that – but most of it is just junk. The idea of getting something free, something fun — is magical. Of course I generalise the smallest, weeniest bit. There are those rare scientists out there who do not appreciate this stuff. Scientists who insist such things do not interest them at all, is a waste of plastic (mostly) and shifts the value of products away from their quality — to the quality of advertising. I…agree. But – having wee distracting toys close to hand is sometimes a life saver; just playing with something can help to clear a mind. 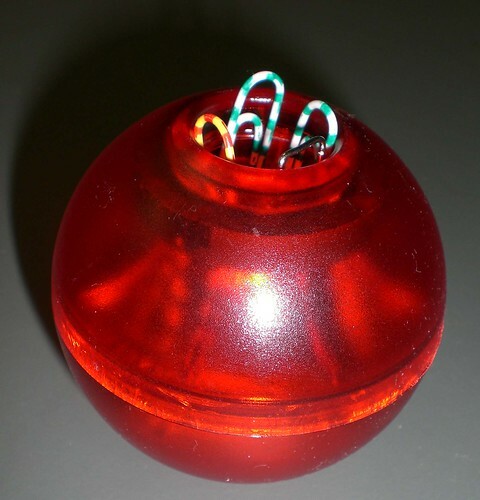 Even the boss has been seen to play with the magnetic stick-&-ball sculpture…thing, on occasion. So it must be alright, right? 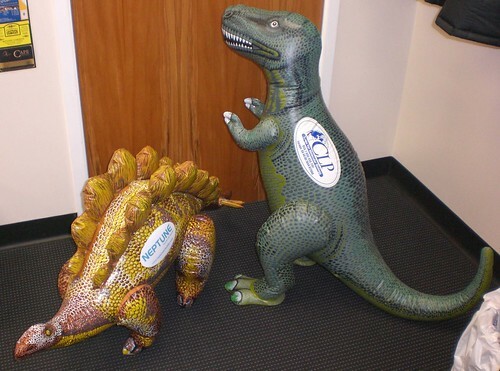 It seems to be particular to New Zealand conferences that so much free stuff is available – and wanted. We have a fair amount of international conference attendance between the 15 or so of us in the lab and the general consensus is that the best loot is to be had from internal conferences, or even international conferences hosted in New Zealand. This phenomenon is not specific to conferences either — product launches and department visits from Sales Reps (a whole other species of science-associated persons) are occasions resplendent with food (’[insert brand here] Morning Tea!’) pens, toys, clothes — and paper. Reams of paper advertising various products for sale. Turns out scientists are swayed by the exact same advertising strategies as the rest of the population — fancy graphics, bright colours, shiny paper and catchy fonts. Turns out — Scientists are kids too.